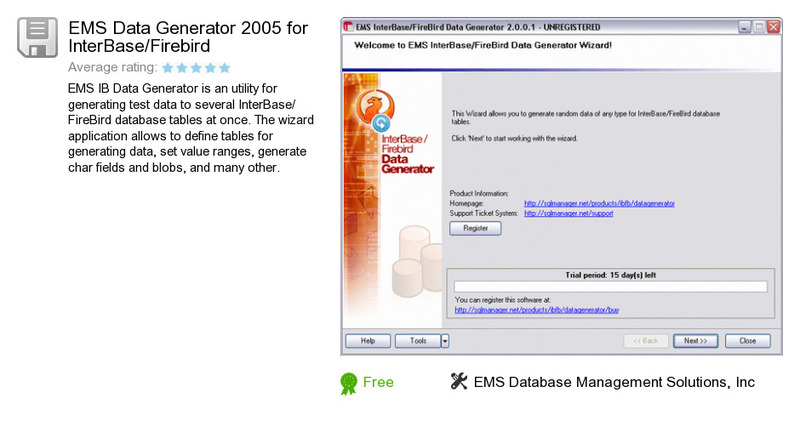 EMS Data Generator 2005 for InterBase/Firebird is a software product developed by EMS Database Management Solutions, Inc. We know of version 2.3. Version 2.3 is downloadable at our site. EMS Data Generator 2005 for InterBase/Firebird package has a size of 10,661,988 bytes. EMS Database Management Solutions, Inc also publishes EMS Data Generator 2005 for MySQL and EMS DB Extract 2005 for MySQL.